86 students are ready to go for next school year! This is about where we were last year in June so we are doing great! It is also time for me to get the budget set for next year so it is vital that I know who is planning on returning next year. If you know you are returning but haven't registered yet, please send me a quick email to let me know so I can properly budget for the next school year. We would also like to wish Ms. D a very happy birthday (4/6). May God continue to bless her always! -If you refer a family and they register for the 2019-2020 school year, you will both receive a $100 tuition credit for September! -Our carnival is around the corner. If you know of a place where we could hang a flyer- a workplace, a local business, etc. please stop by the office and pick up a small poster. If you are able to hang it up & send me a photo, we will give you a service hour! 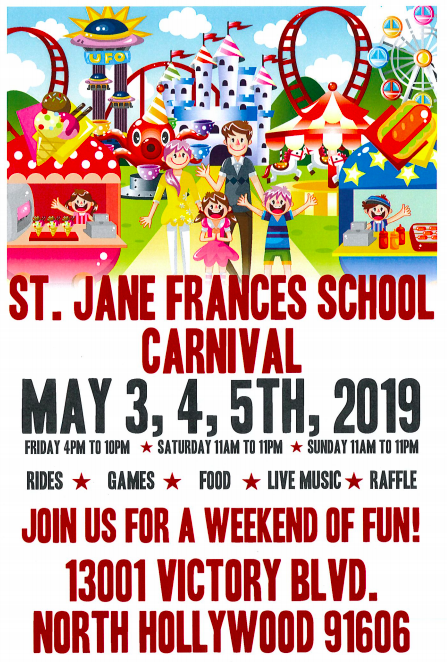 -If you or someone you know is interested in setting up a booth at our carnival in May, please pass along the attached flyer or ask them to speak with Mrs. Giron or Mrs. Whited ASAP as there is limited space for booth rentals. This website gan give parents great insight about current movies, TV shows, apps, and even video games that children have access to. It will let you know what the content is about and who it is appropriate for. As a busy parent their quick overviews and recommendations are sometimes a lifesaver! Do you know a business-owner who would like to set up a booth at our carnival? Please see the order form attached! Our Mission: St. Jane Frances de Chantal School guides our students and their families to experience the harmony between academic learning, social growth, and Catholic faith formation.